Q: My family spends very little time in our home’s utility room, and it’s become a dumping ground for miscellaneous appliances. How can I get the clutter under control and effectively utilize the space? A: Utility rooms don’t get enough love. Because these rooms are generally closed to the public, they are often the most neglected spaces in our homes. That’s a shame, because a well-organized utility room makes daily household activities easier and much more efficient. You don’t have to be Marie Kondo to understand the benefits of organizing. Having ironing boards, laundry baskets, paper goods and vacuum-cleaner attachments in easy reach is essential for effectively responding to any cleaning needs that arise. You don’t want to have to scour your house in search of a hand vacuum after you tracked dirt all over your antique rug. The trick to maximizing the utility of your utility room is approaching its form and function with the same attitude you bring to more public-facing spaces in your home. If you start with the idea that the room is as important as your kitchen, the value of keeping it clean and well-organized will be obvious. Take the project as seriously as you would any other room. Just like a kitchen, the utility room should be tailored to your needs and expectations. Before you rearrange everything, you should start by identifying your most essential requirements. Do you need a depot for small appliances and cleaning supplies? Space to fold and iron laundry? Additional storage for recyclables or amenities? By asking these questions, you will get a sense of the kinds of activities you will need to accomplish in the space, and the varieties of storage suitable to the task. Once you know what you’re trying to accomplish, you can remodel or rearrange the room to optimize the layout to best serve you. Everything from a work station to placement of the ironing board to storage solutions will flow naturally from that goal. The room should be laid out so you can quickly access the things you need while giving you space to work, or maneuver, as needed. If you decide to hire a remodeler or interior designer, it’s essential that they grasp your vision for the space before they start. 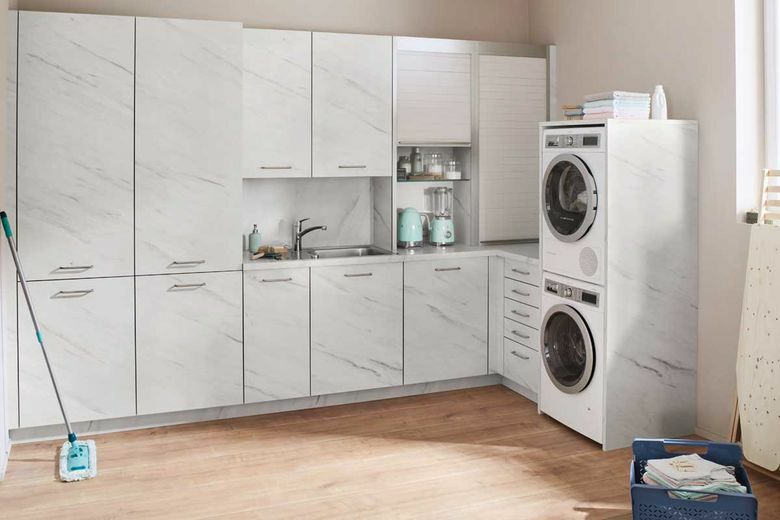 These days there is a wide variety of clever space-saving solutions catering to almost every aspect of utility room efficiency, all designed to meet the specific needs and tastes of the client. You can purchase all-in-one cabinet systems that provide storage and baskets for laundry, depositories for recyclables and additional space for cleaning utensils and maintenance tools. Such systems might also include a tall unit for mops and brooms, and a pull-out ironing board. Whatever uses you decide to prioritize or solutions you employ, getting your utility room sorted will improve the flow of your home and your life. Having a clean, logical and accessible layout will give you the utility you need without the stress-inducing clutter or piles of laundry. The room will go from being a private space hidden away to one you show off to guests. All it takes is caring about it. Natalie Ivashkina is the general manager at Eco German Kitchens, a member of the Master Builders Association of King and Snohomish Counties (MBAKS). If you have a home improvement, remodeling or residential homebuilding question you’d like answered by one of the MBAKS’s nearly 2,900 members, write to homework@mbaks.com.